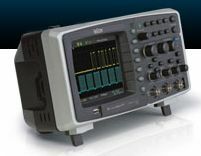 LeCroy WaveAce Oscilloscopes – The WaveAce combines long memory, a color display, extensive measurement capabilities, advanced triggering and excellent connectivity to improve troubleshooting and shorten debug time with bandwidths from 40 MHz to 300 MHz. The FFT displays the frequency content of a signal for in-depth analysis and can be viewed in linear or logarithmic scale. A good oscilloscope should simplify how you work and shorten the time it takes to find and debug problems.The WaveAce combines long memory, a color display, extensive measurement capabilities, advanced triggering and excellent connectivity to improve troubleshooting and shorten debug time. With bandwidths from 40 MHz to 300 MHz, sample rates up to 2 GS/s and waveform memory up to 10 kpts/Ch (20 kpts interleaved) the WaveAce exceeds all expectations of a small affordable oscilloscope. The fast Fourier transform (FFT) is a discrete Fourier transform algorithm which reduces the number of computations needed for N points. If the function to be transformed is not harmonically related to the sampling frequency, the response of an FFT looks like a sinc function. This entry was posted in Oscilloscope News and tagged 100 MHz, 200 MHz, 300 MHz, 60 MHz, fast Fourier transform, FFT, LeCroy, Oscilloscope, Oscilloscopes, WaveAce. Bookmark the permalink.